1. According to widely known Klondike Gold Rush facts it was one of the largest gold rushes in the history of the world along with California Gold Rush and Australian Gold Rush. 2. Klondike Gold Rush has many other names that it’s often referred to as The Last Gold Rush, Yukon Gold Rush and even Alaska Gold Rush. 3. The Klondike Gold Rush facts have it that it lasted mere 3 years (1896-1899) and very few people were able to actually get wealthy. Many gold miners reported that the actual gold value of discovered nuggets was greatly exceeded by big losses sustained while traveling to the remote mining sites. 4. Bonanza Creek was the place where in 1896 the first natural gold nuggets were discovered by an American gold miner named George Carmack. 5. 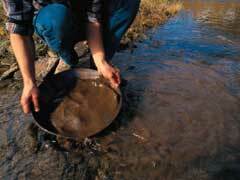 According to other interesting Klondike Gold Rush facts the gold panning methods used were rather labor intensive because gold nuggets and gold dust were not on the surface but laid rather deep into the ground, sometimes 10 feet below. Miners could only gold prospect during short northern summer months or had to resort to thawing frozen ground prior to digging by burning fires continuously. 6. Very few people prospered from actual gold mining. In fact, more people got wealthy by supplying gold miners with food, mining tools, equipment, lodging, and saloon entertainment. Some other companies that made fortunes were steamboat owners, merchants and gambling joint owners. 7. The largest gold nugget discovered during the Klondike Gold Rush era was considered a gold nugget that weighted at 72 ounces of pure gold. In 2011 a similar gold nugget is valued at almost $130,000. 8. Klondike Gold Rush inspired Jack London, the famous American novelist, to write one of his well known novels titled The Call of the Wild in 1903 that described the life of a dog named Buck in the wilderness of Alaska and Canada during the famous Yukon Gold Rush. The novel is very often categorized as a juvenile fiction work, however, adult readers enjoy it nonetheless. 9. One of the most famous silent movies in the cinematographic history released in 1925 with Charlie Chaplin starring portrayed the events and hardships of the Klondike Gold Rush era. Despite the fact that it was a silent movie, it received the nomination for the highly acclaimed Academy Award for the best sounding recording. 10. The Yukon areas in Canada are being continuously mined even in the recent years. There are still quite a few of gold mining companies stationed in the Klondike area.